A Thought Shared ....: The Twilight Zone.. The oceans of the world are amazing places, where all kinds of weird forms exist. It is said that all terrestrial life started off in the oceans, some having crawled out a very long time ago, and plant life by virtue of the fact that some got used to being above the surface in air. The color and diversity of sea life is almost beyond comprehension. We create environments where we can watch and study fish, in bowls, tanks, aquariums and sea-quariums, but we can't see everything in this way because some are too large, and those that aren't require very deep water indeed. Watching fish can be quite relaxing, as they glide around in three dimensions, and even the not so pretty are fascinating, like Conger eels, Stonefish and the Octopus. The rest we have to see on TV, brought to us by submersibles that can descend way further than any diver with a camera. One has to be prepared though, because some of the real deep sea creatures are just not pretty at all. Three examples here are the Angler Fish (top left), the ViperFish (middle right), and the Fangtooth (middle left). All three are active predators that either wait for food to fall to their level or rise at night to where live food is more plentiful. You will be pleased to know that they live deeper than 200 metres so don't panic when splashing about where shore meets water, not however applicable t o the Stonefish. It doesn't bite, but is armed with highly poisonous spines, and it lurks in the shallows of tropical waters. 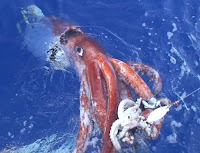 For the sea fisherman, rules change a little, and sometimes he may come face to face with a denizon of the deep as in the last picture, where both fisherman and Giant Squid were sharing prey.